Not sure about you, but I’ve always enjoyed a good read that’s related to something I’m interested in; never miss a chance to get into it. This joint would have been like an art museum, had everything not been for sale. The showroom ceiling was HIGH creating a roomy space, light was bouncing everywhere so the frame colors erupted! The aroma was fresh and sterile, the floors polished clean. The walls were covered with what could only be described as bike art, but you could only see it if you managed to break free from navigating through the treasures on high display, like mounted statues of hero generals. New tires full of tread begging to be worn were everywhere and the staggering placement of the bikes was nothing less than choreographed. That’s really the only time I thought things were a little shady. But, it could be all in my head. Eventually, we were ready to purchase for the 96 models. My buddy opted for a suspension, black .2 I think, with a yellow Judy. I wanted a hard tail and came home with a .3 because I loved the color. I could afford to upgrade, barely, but the components weren’t as important to me as was the sleeper brown paper bag skin of my chosen. And so it’s about time to revisit that old bike that has stayed with me through so many moves. At this point, I don’t ride enough to justify dumping a lot of money, just want to freshen up a bit. I had neglected for years, took on the occasional spin but nothing real regular; just this last summer threw about $50 in cheap tires and tubes plus a set of pedals at it, then hit the asphalt bike lanes on the work commute. Front hub finally gave out and the OEM crankset teeth are about done, high torque would be bad news. I thought heavily on just finding a new-to-me homegrown but at the end of the day, more enjoyment would be had showing some love to this young-at-heart Schwinn. This project is something of a build, I guess. But as any project goes, a sequence of events is gonna take place. Something most of us can identify with and appreciate: reaching for and grasping at, more NOT than often getting a grip on the elusive. An old bike, not a Homegrown, but the spirit is there! 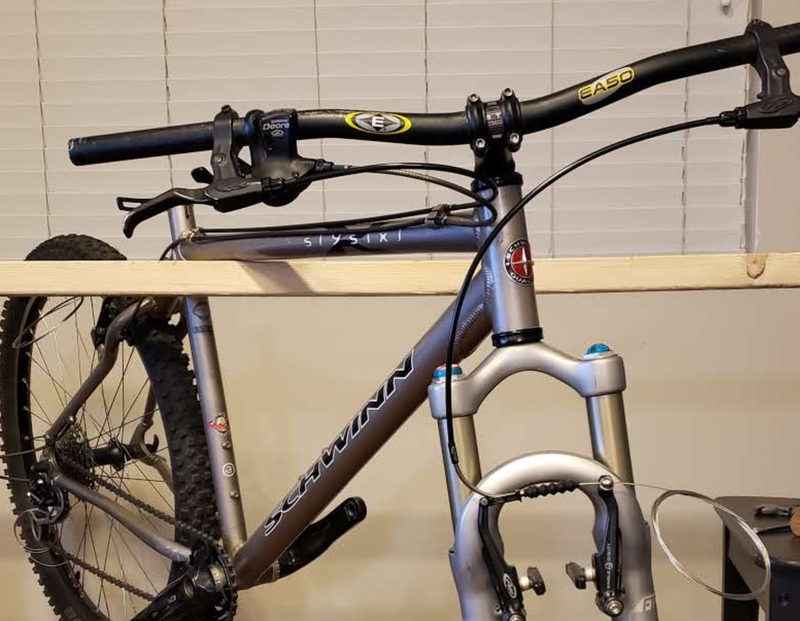 So last weekend I picked up a decent donor 17” Homegrown for $300, has XT components with a 9 speed cassette, Easton bar and seat post, decade old Fox F100 RLT with good rebound, Cane Creek headset (sealed bearing!! ), newer Schwalbe Hans Dampfs on Magic XC 717s, Avid single digit 7 brakes. To me, these are major upgrades! And from what I can tell so far, everything is compatible (in this image, I had swapped the seat posts). I have very little experience with working on bicycles. So, this past week, spent every day in one of the two LBSs near me, probing and carefully shopping. 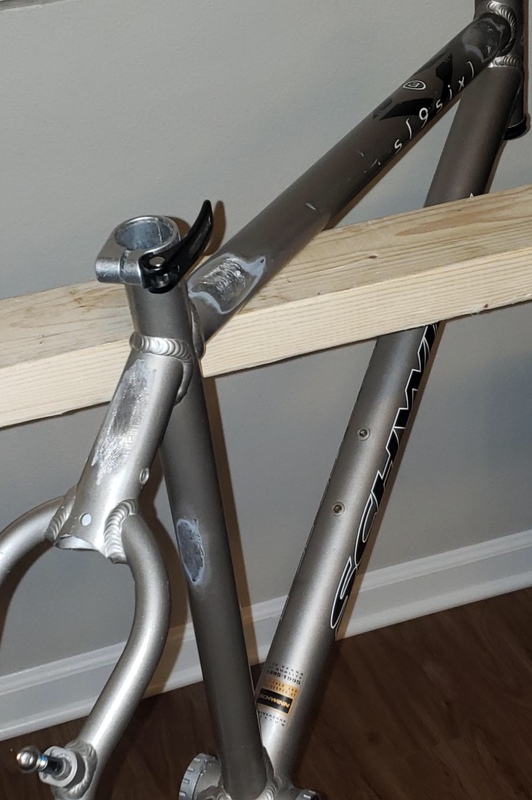 In a sad way, I got lucky because one is closing it’s doors and tools were 40% off; since I’m taking everything down to the frame, I was able to pick up some “lower quality” tools (not Park) to do what I needed without a lot of buyers remorse, Craigslist doesn’t have a lot going on and I want to be selective vs going all out, so far so good. 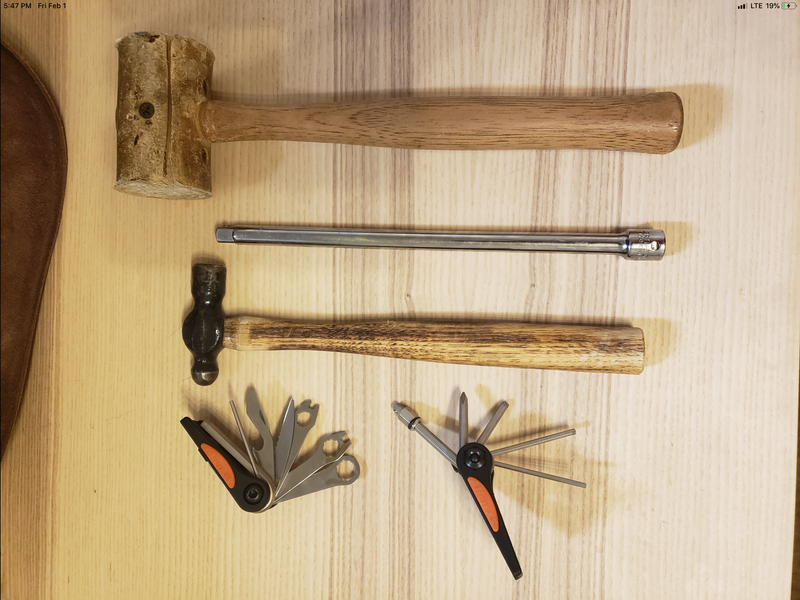 I’ve been using my old TopPeak multi-tool for everything I can, good to have an understanding of what it’s capable of! 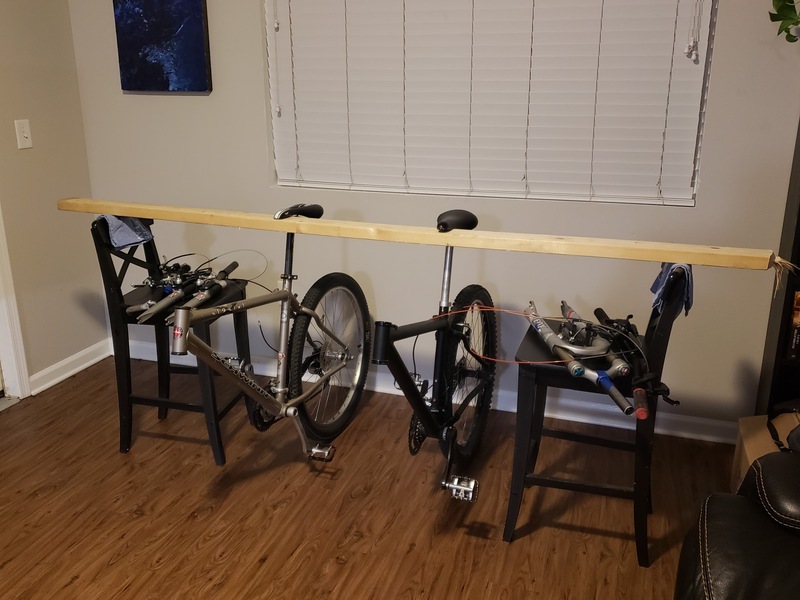 I also fashioned a work bench out of a found 14’ 2x4 hacked down to 8’, resting on two bar chairs (apartment dweller right now, no real shop space). Faced a bit of a dilemma with the headsets. 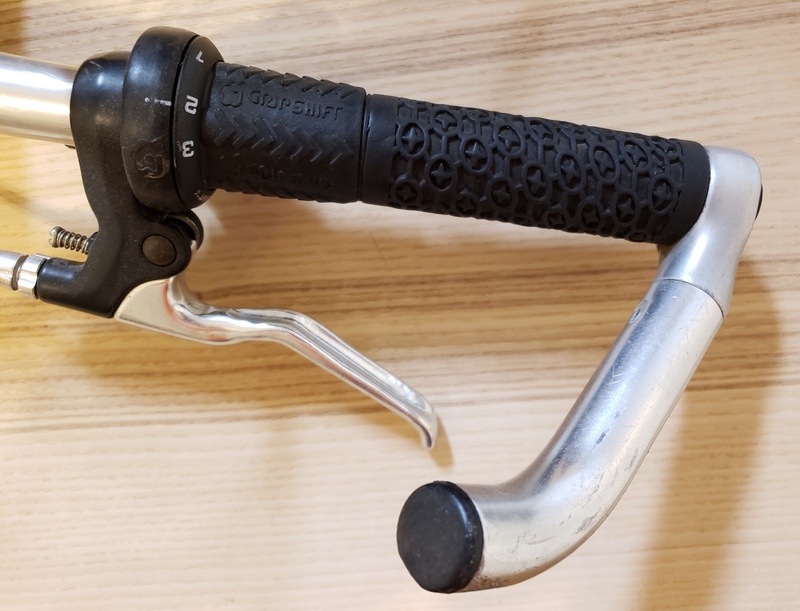 Finally figured out a resolution, simply took a long 3/8 ratchet extension and a small ball-peen hammer I had to tap out the head sets, then a wooden mallet and some lithium grease helped tap the CC headset back onto my 96. So, now we are down to the frames! Other than the bottom bracket removal, I think the rebuild is on track. Not too bad for a week. Feels pretty good, actually! Got the old bottom bracket off, replaced a new sm-bb70 for it, that's the good news. 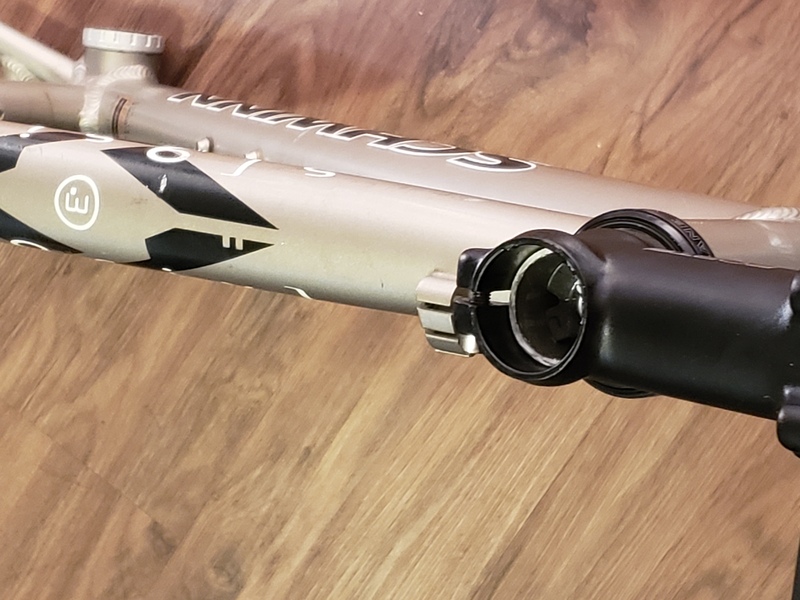 The Fox steerer tube is a bit short, which I didn't think would be an issue because there were spacers on the HG donor tube. Just enough to complicate things. 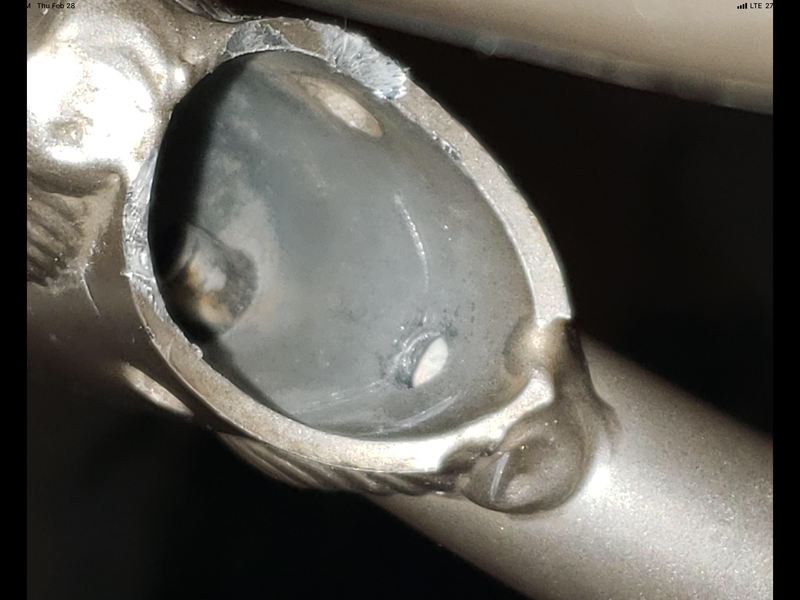 I suppose if I wanted to keep the Fox, I could have a machinest precicely shorten the head tube since there's enough room away from the welds. Will sleep on it. Live and learn. Cool story and progress pictures. Can you use a shorter stem? Do you remember the text of the error message you were getting. I can see it in the logs but it's pretty ambiguous. Don’t remember exact message, but suspect it has something to do with not using the default forum tools vs initially using the iPad keyboard functions (italics, emoticons, etc)? 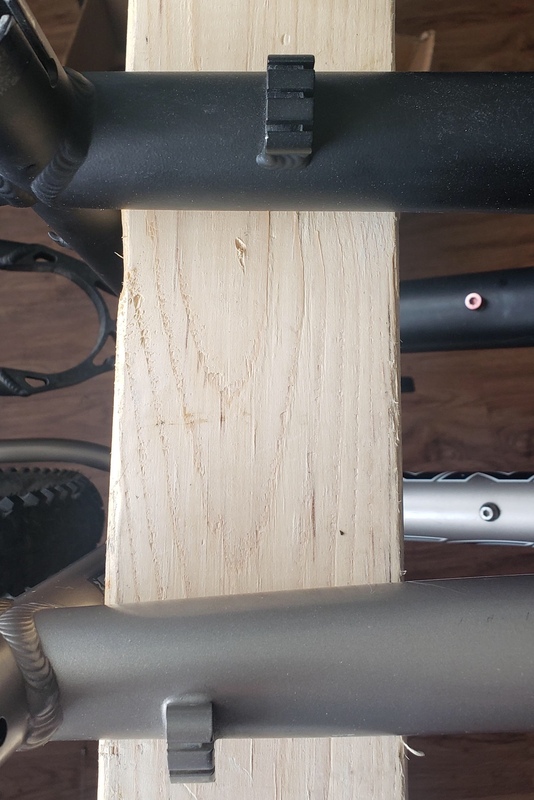 Hmm, thanks for the head’s up on the stem! Did some research on stems and found out there are some brands out there that carry a lower stack height. 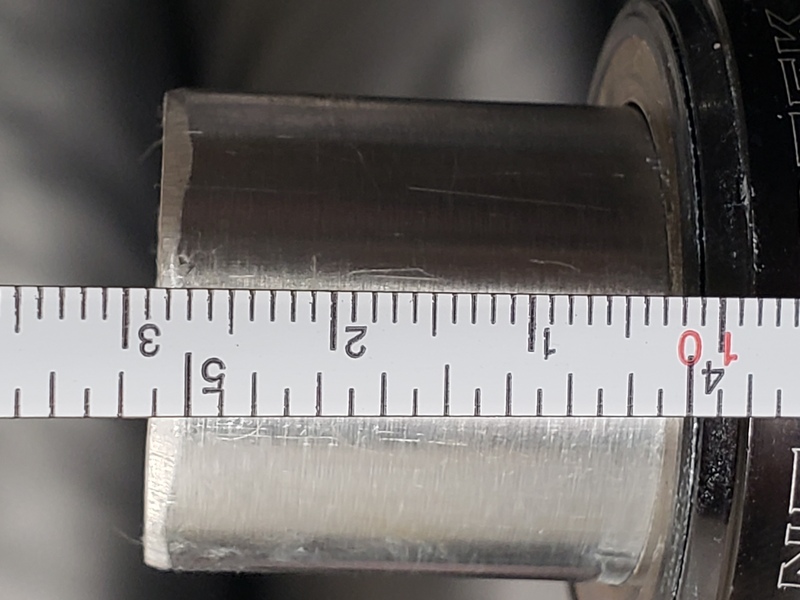 I took a measurement, looks like just over 28mm of available real estate (closeup is deceiving, the 10mm line is level with the lower headset). Not a lot to work with but maybe? Cool story. Bummer about the steerer tube being short. 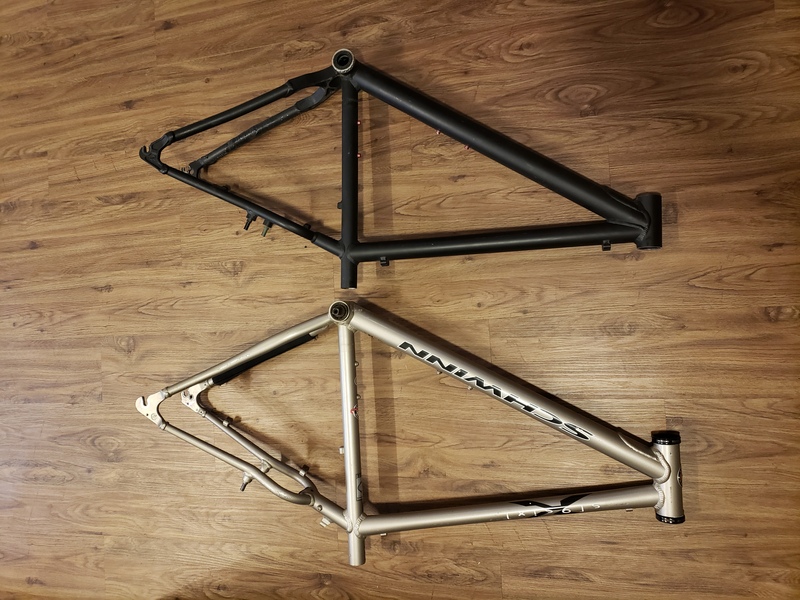 I had the same issue with a frame of mine and just got another fork. 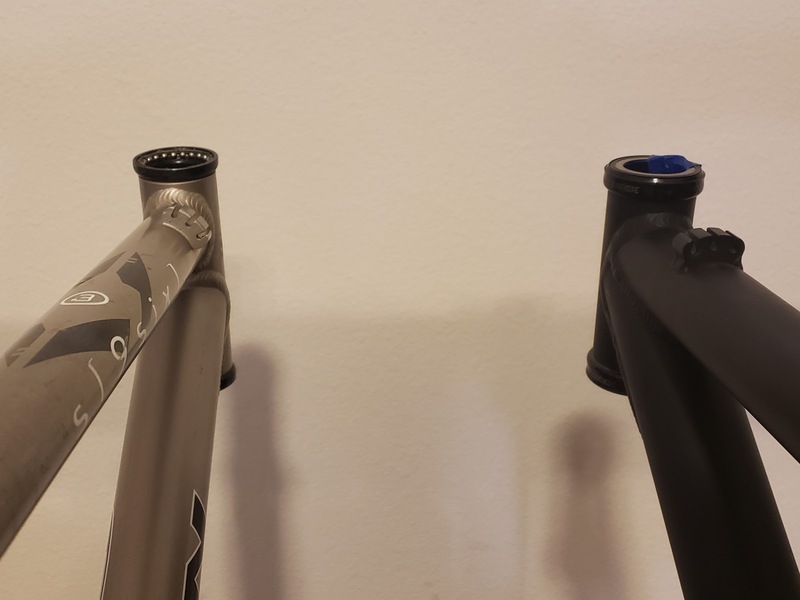 Looking for a stem with a shorter stack height is another option. 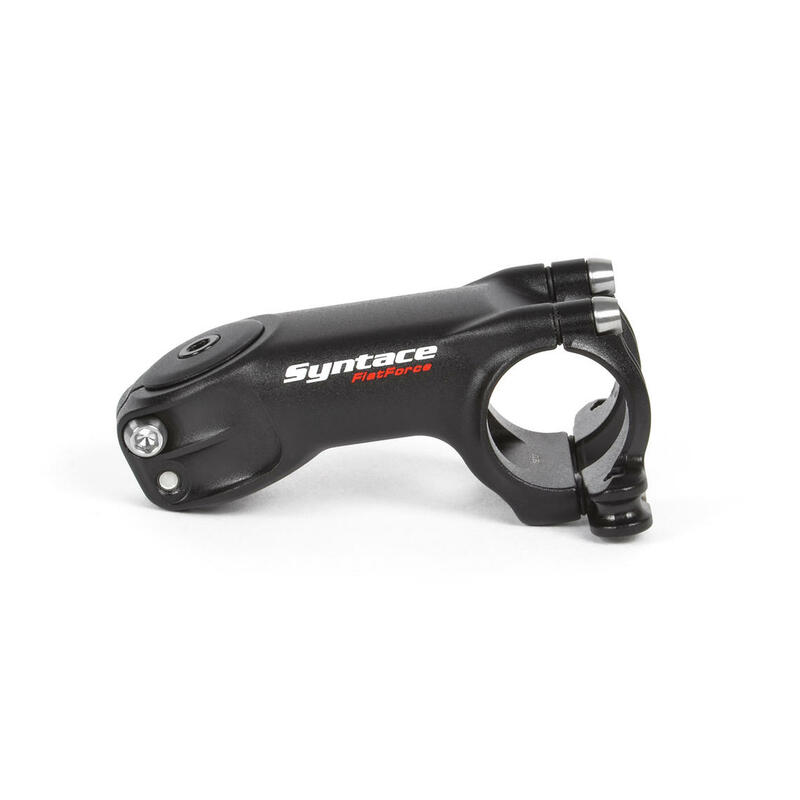 Thanks Jeff, I’d like to find a new stem since I’m not too high on what I have, found this Syntace Flatforce that has a 25-27mm stackheight (depending on which spec outline you read). Kinda spendy though, ~$80 but at least it’s an option. If anyone has any thoughts, give a shout! Might be able to find another fork and sell that one to recoup some funds. Progress update! By chance came across a guy who had this XT (I believe a Shadow M77 9 spd) taking up space, so will start it out over the heavier M750. 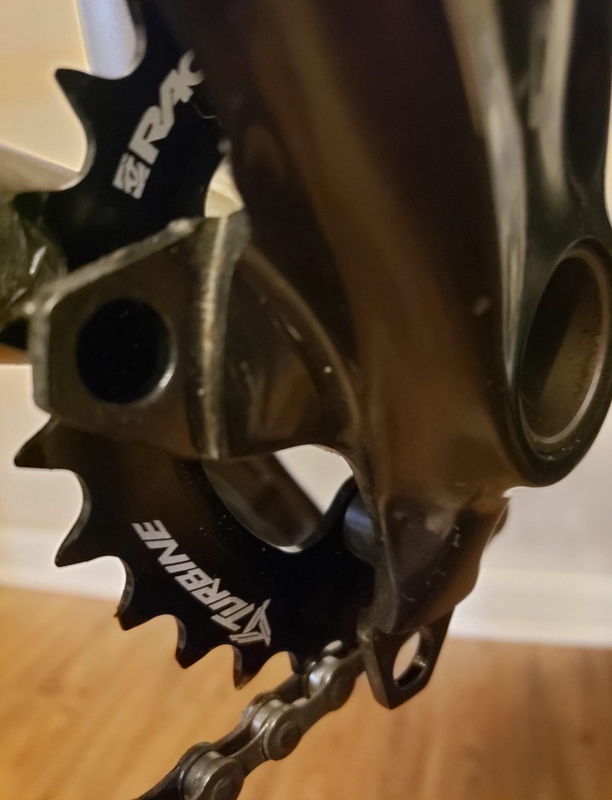 Also am going lose the front derailleur and run a 1x9, found a RaceFace 28t at the shop going out of business, got it for $10. Sounds like ideally a 30t or 32t would be better, but the price was right! Will likely cut the tabs off of crank later. Is that front chain ring a narrow wide? 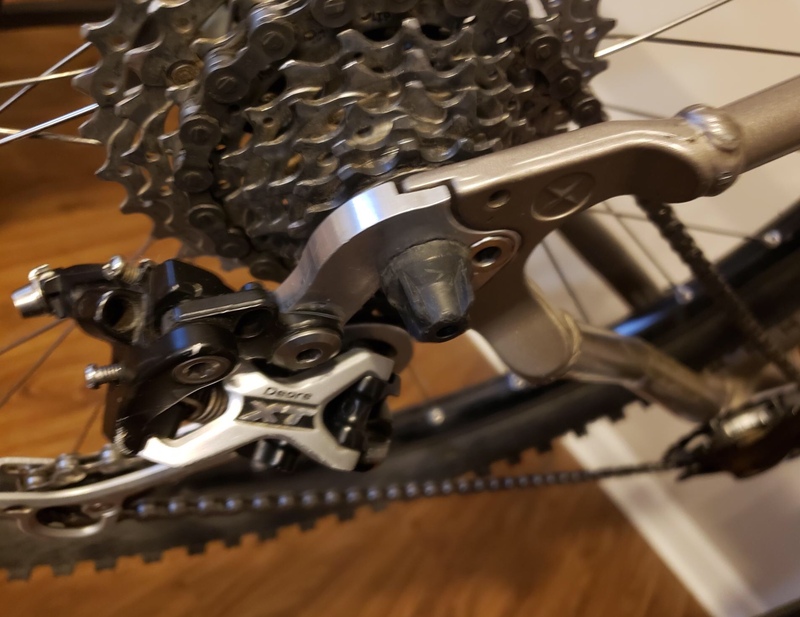 If not you might have some chain retention issues. hm, just saw this post and thanks for attention; will do some research. Much appreciated! Picked up new housing and cables. Initially bought a road bike derailleur cable, took a bit of head scratching before I figured out it was a different animal, couldn’t understand if the wire end hooking screw was lost in technology! It’s not. And here’s where it’s at. No new stem yet so adjustments will be made later, although cables and housings are fitted as it sits; components aren’t thread-locked yet, this is just a mock. Major hang-up (which I’m sure most of you HG riders don’t even realize is an issue) is the rear cable stop. On the HG (or at least this donor) it sits center on the top tube and 5cm from the seat post tube. On the s, it rides off-canter on the drive side, just 3.3mm from seat tube. So, running the rear brake cable is really tight around the tube. Not happy, tried all kinds of configurations and ferrules. 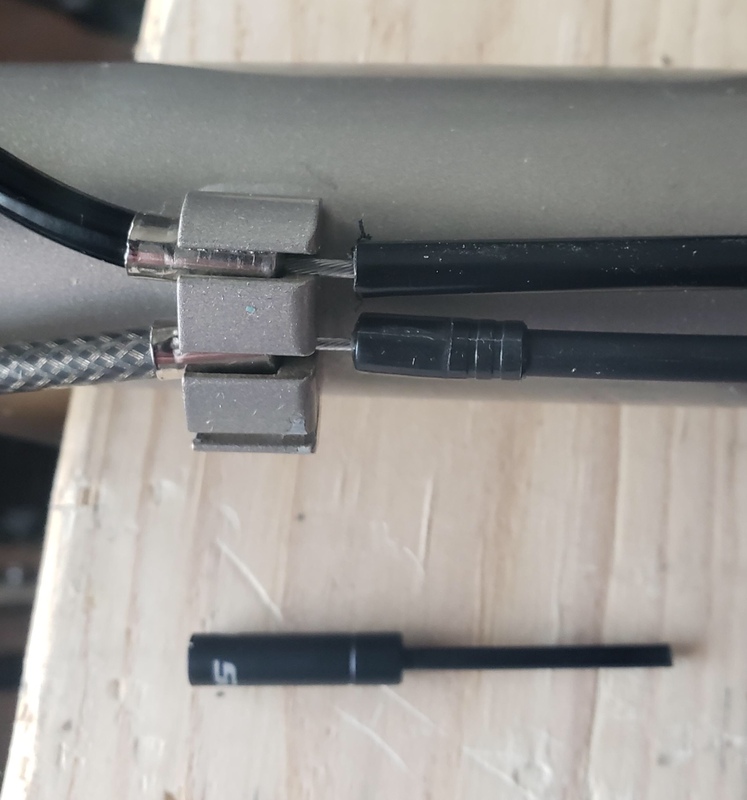 So, weighing pros and cons of an internal cable mod. On the rear brake, would be a simple task, lots of realestate on the top tube. 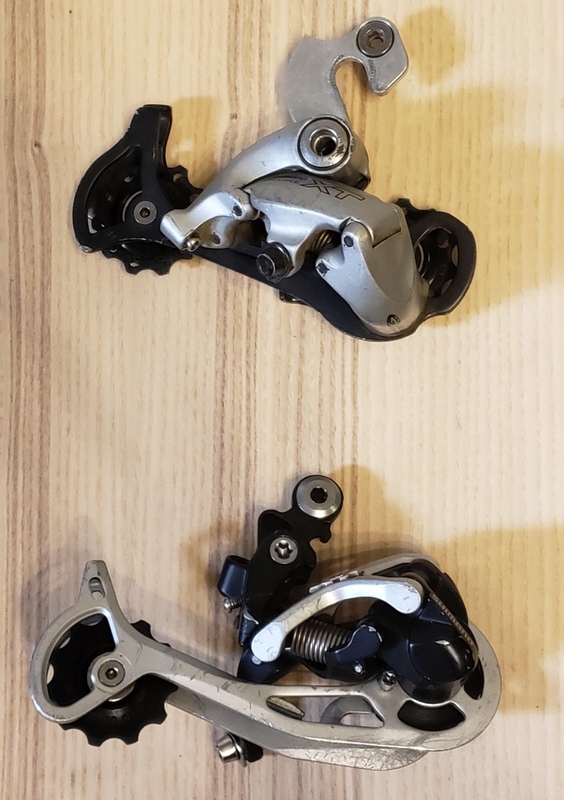 Running the rear derailleur, an ideal exit would be directly out of the chainstay; however that may create a stress riser so not sold at this point. I used a 135 degree noodle to go around the post. Ok, I’ll look for one, thx for tip! 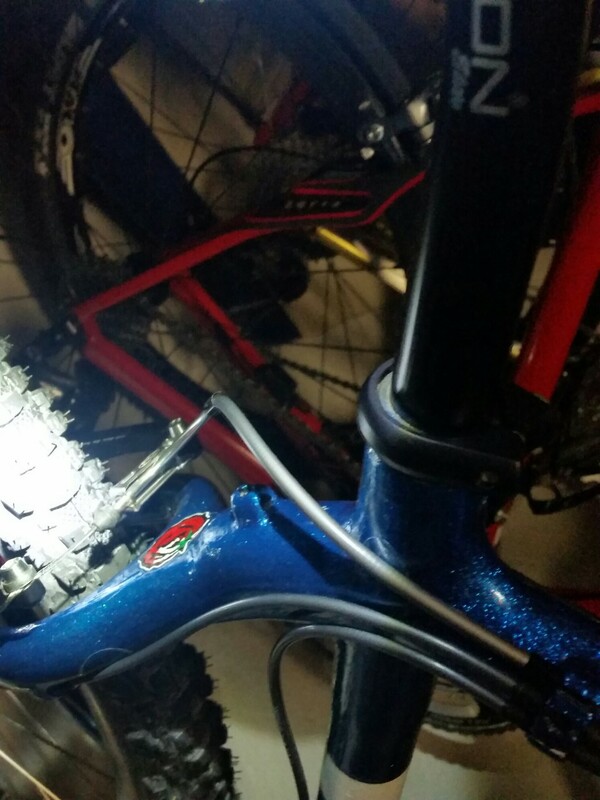 So around seat tube on the drive side still in the far left cable stop it looks like. What’s distance between your cable stop and the seat tube? Mine is 3.3mm. 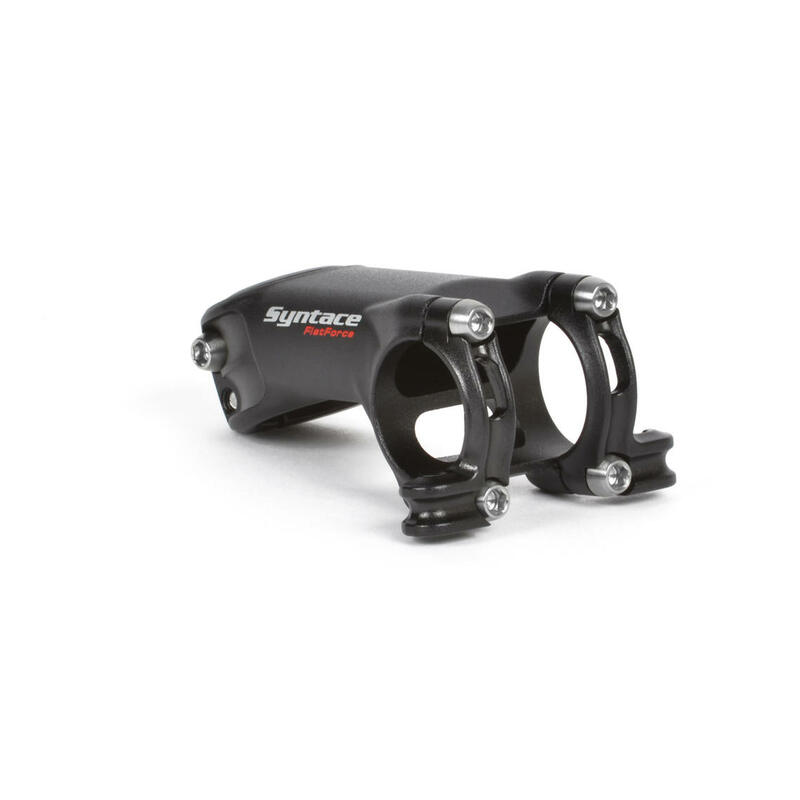 You NEED an Avid SAAGO stem to solve your short steer tube problem. Lengths and rise are minimal choices but there are 3 on eBay right now. The collet grips the steer tube and doesn’t need much length at all. 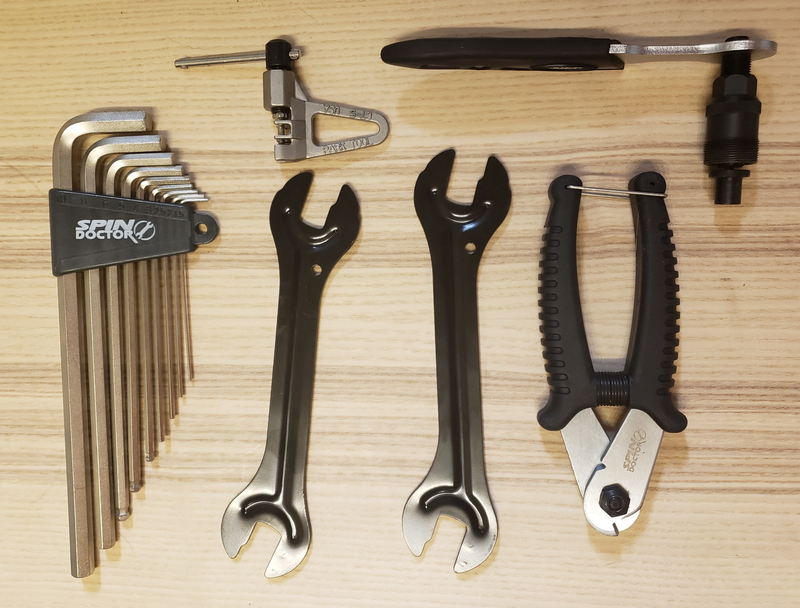 Thanks for heads up on the Avid stem, however I’ve opted to convert to a 31.8 bar. 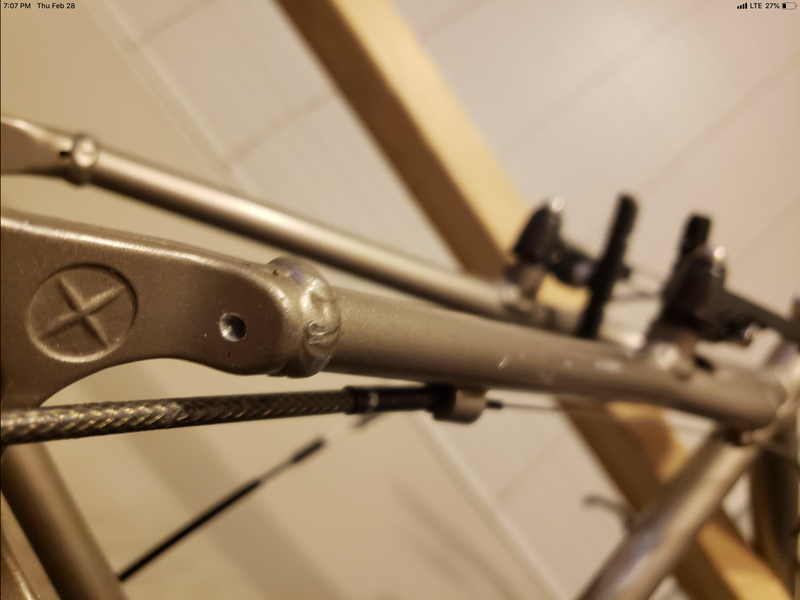 Have also committed to internal cable routing, chose a DuraAce poly-coated cable set for rear, all prepped to run it through top tube, bypassing modified seat post, down through seat stay to exit the drive side dropout. So I missed Jeff’s earlier advice on chain ring specs, will have to revisit! 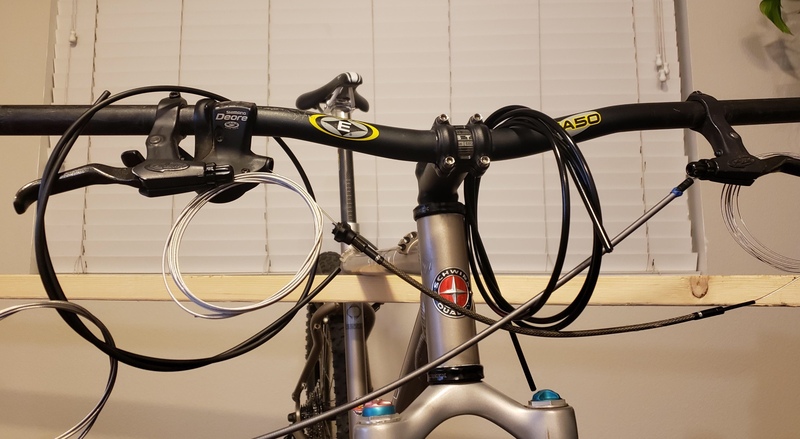 Meantime, I understand there is some controversy about internal vs external cable routing; to clarify, this project is a personal exploration of rebuilding a bike with a deep interest in an educated process of customization. I would not butcher a true Homegrown, just FYI, but it’s kind of my civic duty to play around here. So, been tooling around a lot with cables and housings, etc. After a week of moderating a tormenting overhead fight between imagination vs sheer mechanics, boiled over enough to carefully shave every cable stop off the frame (6 I think?). All sites smoothed out, beaten with 80 grit and cleaned, about to prep with body filler now. I see you’ve already gone the route of internal cable routing, so this won’t apply to you. 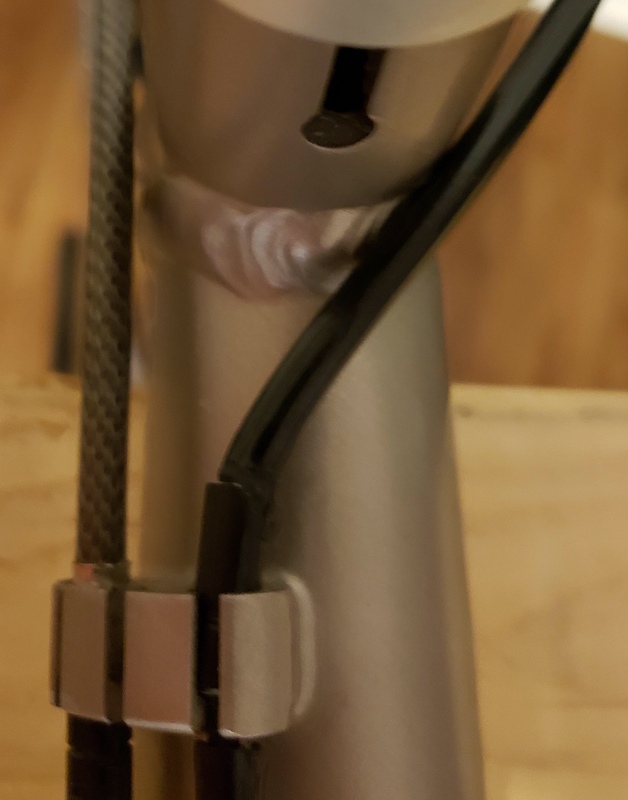 Solution I’ve found on a Factory frame with drive-side cable stops is using an Avid Black Ops rear v-brake. You can choose which side to use the noodle on them. Makes for a really slick and straight housing route.